With the new Minnesota standard that ALL students MUST take Algebra 1 no later than 8th grade, many districts and schools are interested in upgrading their K-6 teachers’ algebra skills and strategies. This is Bob’s specialty. See the following paragraphs for further information. The professional staff development session “Teaching Arithmetic with Algebra in Mind” focuses on specific ways in which regular K-6 arithmetic can be taught – as early as Kindergarten and First Grade – in ways that better set kids up for success in algebra in eighth grade – all without changing the curriculum being used. There are specific items, concepts, connections, and principles – not just new “tricks” – that can help both teachers and students think in broad, generalized, conceptual categories about arithmetic. 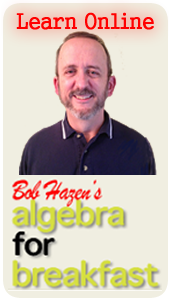 This approach to arithmetic better prepares students for what algebra actually is: generalized arithmetic. Session length can vary from 6 to 12 hours more. Contact SAI at 651-645-4432 about fees. Description: Demonstration of and participation in a variety of math games that can supplement and enrich the mathematical experience of your child, student, or classroom. Games provide motivation, enjoyment, and context for acquiring math mastery and can be a vital part of a child’s learning, regardless of curriculum being used. Target Audience: Parents with children ages 2-6. Description: Similar to topic #1 above, with focus on early childhood and pre-school years. These games and activities help establish in children a foundation for success in math in low-key, enjoyable ways. Target Audience: Parents and/or teachers of children in grades K-6 interested in learning how to teach some of the key math games and develop a math-rich home or classroom. Description: Participants will have hands-on practice of specific math games and activities for developing skills of logic, geometry, spatial sense, and mental math. Length: 3 hours, plus 1 follow-up hour with at least one contact person in the group. Target Audience: Parents and/or teachers of students in grades 6-12, and students in grades 6-12. Because this game is EXTREMELY difficult to learn on one’s one, it’s worth it to have an experienced trainer like Bob teach your group how to play this game, for hours and years of fun and learning. If you would like to request a booking, click here.